Participation by two generations of younger voters, millennials and Generation Z, grew strongly in the 2018 elections, both nationally and in North Carolina. Generation Z voters, those born around 2000, are the latest generational cohort to begin reaching voting age. Their numbers will only grow in future elections as more age into the voting pool. 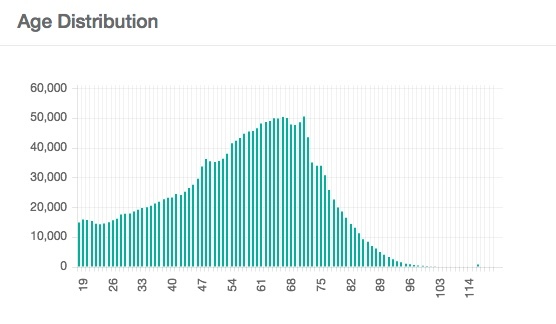 Millennials are the preceding generation, which came of age around 2000. While both groups increased their percentage of the state’s registered voters this year, how many of them participated in November’s general election won’t be known until after the final results are broken down later this month. However, unofficial returns from absentee mail ballots and the 17-day early voting period point to a higher turnout among both groups. Michael Bitzer, professor of politics and history at Catawba College, said it’s still likely that statewide turnout among younger voters in 2018 could fall short of their registration percentage, but going forward, their rising numbers and their voting patterns have the potential to reshape the political landscape. “They are the biggest percentage of the voter registration pool, and if they have the voting tendencies that we think they have, then this is a whole new state, it’s a whole new dynamic,” he said. Both groups saw a rise in registration, with many signing up as unaffiliated, pushing that designation past the number of registered Republicans for the first time earlier this year. As of Nov. 10, registered voters included 2,690,192 Democrats, 2,253,653 unaffiliated and 2,112,588 Republican voters, in addition to those in minor parties. But among GenZ and millennials, registering as unaffiliated has been the popular trend. The younger groups account for 2,301,541 North Carolina voters, including 951,606 unaffiliated, 783,201 Democrats and 542,732 Republicans. If the registration trends seen in 2018 continue, Bitzer said, as much as 36 percent of the voting pool in North Carolina will be under 40 years old by 2020. “The question is, do they show up?” he said. If they do, the result could spell trouble for Republican candidates. 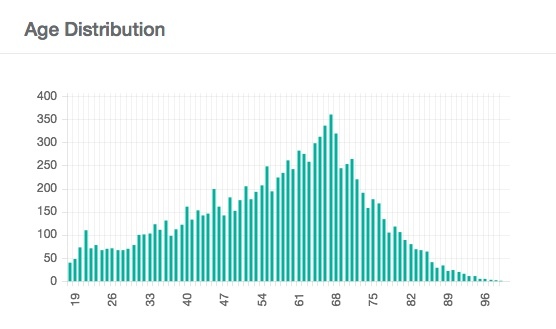 Both millennials and Generation Z voters are registering as unaffiliated in large numbers, but the number of those choosing to register as Republicans has drifted lower. Millennial registration as of Nov. 11 is 40 percent unaffiliated, 35 percent Democrat and 24 percent Republican. GenZ voter registration stands at 46 percent unaffiliated, 30 percent Democrat and 22 percent Republican. Bitzer said he expects the number of GenZ voters registering as unaffiliated to soon reach 50 percent, but that lack of a party label shouldn’t be read as a sign they are ambivalent about politics. Nationally, millennial voters are leaning center-left. This year will be the first major look at how GenZ voted. 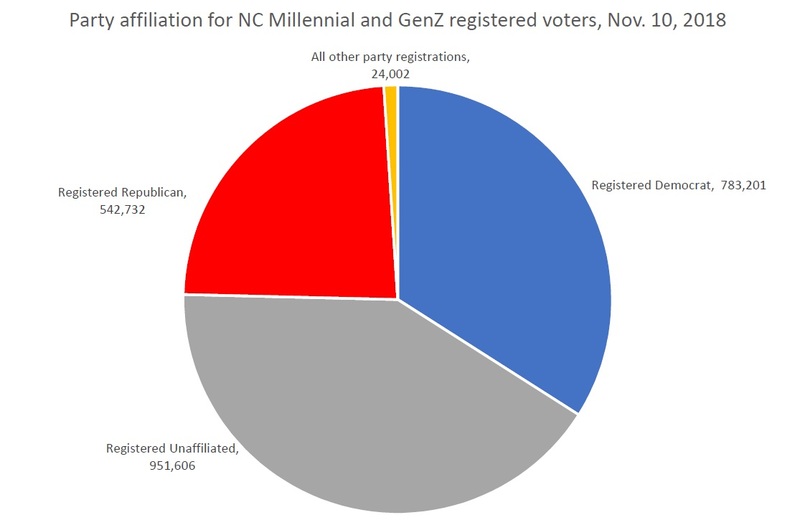 This pie chart shows the Nov. 10, 2018, party affiliation breakdown for Millennial and GenZ registered voters in North Carolina, based on data supplied by Michael Bitzer of Catawba College. The results are key, not just to determine current voting patterns, but in getting a sense of the future. Millennial and GenZ voters are developing voting habits that most will continue throughout their lives. 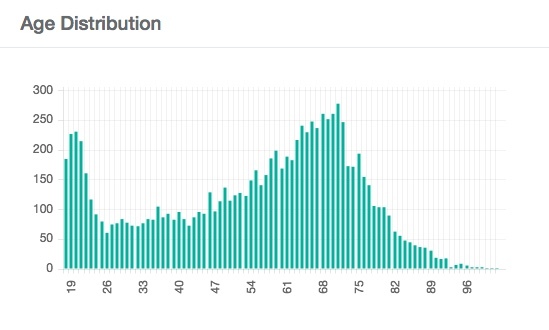 North Carolina’s demographics are shifting every day, Bitzer said, and Democrats have a closer connection to younger voters. Cameron James Minor turned 18 last year. He cast his first vote on Election Day in Alamance County in the Mebane Arts & Community Center. After walking out of the precinct, he said he was glad to have a chance to vote. “It’s a great feeling of being able to change your community,” he said, holding a copy of A Tree Grows in Brooklyn that he brought with him in case there was a wait. He was in his senior year of high school last year when 17 people were killed at Marjory Stoneman Douglas High School in Parkland, Fla. He said he was moved by the reaction at his high school, which held a vigil and a walkout the day after the event and by the efforts of the Parkland students who spoke out against gun violence. As more data flows in about turnout in North Carolina’s midterm election, there’s a keen focus on Generation Z, which currently represents about 5 percent of the registered voters. Although the final results of how many 18- to 21-year-olds voted in North Carolina and how they voted won’t be known until after this week’s canvass, there’s evidence already that at least in pockets of the state they made a difference. Early voting numbers in Jackson and Watauga counties show a surge of younger voters as on-campus polling sites and get-out-the-vote efforts at Western Carolina University and Appalachian State University drove turnout that boosted Democratic candidates and flipped two GOP-held state House districts. The two counties are among the highest in turnout so far among Generation Z voters. Jackson County’s early voting results showed that 29 percent of 18- to 21-year-olds voted early. Gen Z early voting turnout in Watauga County was second-highest in the state at 36 percent. Only Orange County, home to the University of North Carolina, saw a higher turnout among the youngest cohort of voters, with 38 percent voting early. 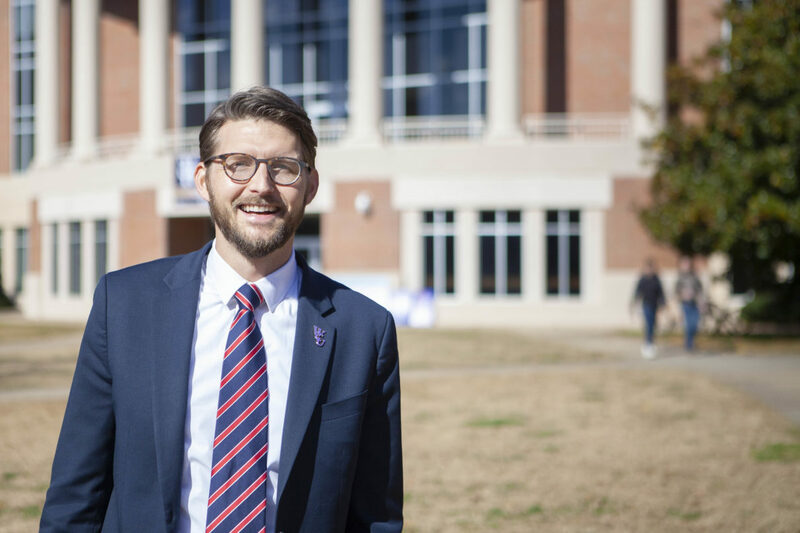 Lane Perry, executive director of Western Carolina University’s Center for Community Engagement and Service Learning, said student turnout jumped this year, more than doubling the early vote in 2014. Some of that is due to the addition of an on-campus voting site, which was approved the first time for the 2016 presidential cycle. But Perry said the site wouldn’t have been as big a success without years of groundwork to build voter student engagement. 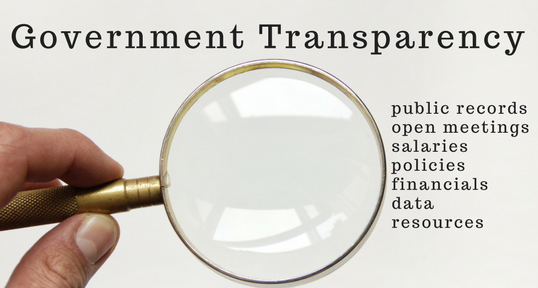 It began when students started organizing registration around a local referendum in May 2012 to allow countywide alcohol sales. The effort proved effective, and Perry said it illustrated a valuable point about tying issues to voting. “We know that when you connect issues to the ballot box, that can get people excited about going out there and letting their voices be heard,” Perry said. 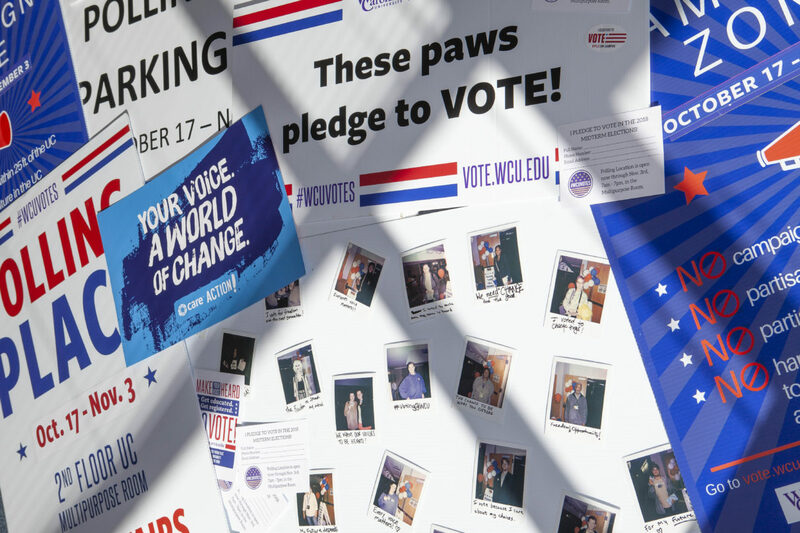 In 2013, after the university ramped up efforts to increase student civic engagement and gradually built programs to improve voter education and expand voter registration on campus. Perry said the WCU programs have been focused on the process of voting and civic engagement and not taking sides in individual races. Much of it is making sure students are registered correctly, which is a challenge on college campuses where there are dozens of addresses. One of the students’ latest initiatives is in support of legislation to allow online registration. “We’ve had quite a lot of support on both sides of the aisle,” Perry said. In 2016, when students presented a petition to the Jackson County Election Board for an on-campus early voting site, representatives from both major parties were on hand to speak in support. The results of the election, however, could lead to more partisan resistance to the student vote at WCU and the rest of the state. Perry said that while he’s seen very little resistance to WCU’s efforts so far, he’ll be interested to see what happens as 2020 approaches, especially when it comes to the on-campus voting site. “I’m anxious and interested to see what comes up in the next round, because it is not guaranteed from one election to the next,” he said.